If you tried to search for a local domain on the ZISPA website today, you were probably met with an error or, in the case of the website’s home page, a listing of the website’s archived versions. The website has, for some reason we don’t know yet, been taken down. It could be a update going on, a mistake, or something else, that we will find out when the email we have sent the ZISPA chairman has been responded to. As a result of the problem, other websites that use the domain checking tool have been affected. Like name.co.zw, Zimbabwe’s first online based domain registration website. The technical amoung you will know however that the website itself is still reachable if you get into one of those folders. The one that’s just named “zispa”. The other folders will still work but except for the domain checking tool, the other information is outdated. ZISPA, short for Zimbabwe Internet Service Provider’s Association, the a self regulating body of the internet providers in Zimbabwe (both licensed and resellers). The organisation maintains domains in the “.co.zw” namespace. Update: The response from ZISPA was that they were updating the site. Site is back to normal now. heres hoping for an update and a better looking site! and ZOMG – its running apache 1.3.x – thats positively ancient software! 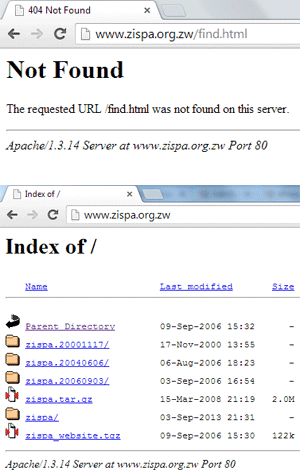 http://zispa.org.zw is still down but http://name.co.zw seems to be working fine now.